Anyone who handles pet chickens knows how important chicken wire (also known as poultry wire), mesh, and netting are to keeping your flock well managed and cared for. While we love our hens and think of them as part of the family, the truth is the rest of the animal kingdom views our fluffy butts as an easy meal or a toy to be played with. It’s important to protect your chickens from predators – and that’s where a solid run built out of chicken wire comes in. 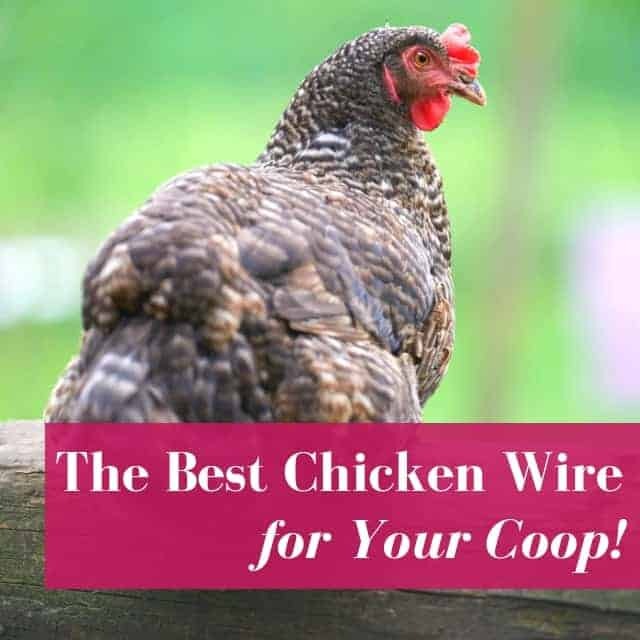 If you’re just starting out with backyard chickens or are building a new coop, this article is your guide to choosing the best poultry wire possible for your flock. What is chicken wire used for? How much does a chicken wire fence cost? Where can I buy chicken wire? What size is chicken wire? How do you set up chicken wire? How do you nail down chicken wire? How do you keep chicken wire in the ground? How far apart should fence posts be for chicken wire? Does galvanized chicken wire rust? What staples for chicken wire are best? Is chicken wire predator proof? Can predators get through chicken wire? Can raccoons get through chicken wire? Can a fox chew and climb through chicken wire? Can skunks chew through chicken wire? When was chicken wire invented? What is stronger than chicken wire? Chicken wire is a mesh made of of wire strands, and it’s used to keep hens inside their run. Without it, you might find chicken poop on your porch constantly, or a constant influx of predators trying to make a meal out of your pets. Chicken wire is made of thin, flexible, galvanized steel wire with hexagonal gaps. It’s relatively cheap and easy to work with, which makes it so attractive for coops. Sometimes it’s coated in plastic. The price for different types varies depending on the brand and the desired wire sizes. Cheap chicken wire is relatively easy to find, and you’ll pay roughly $.50 to $3.50 per foot, depending on how small the hexagonal holes are. Big box stores like Home Depot or Tractor Supply have 50 feet of ½ inch chicken wire on sale for less than $30. This is a small price to pay to ensure your fluffy butts are tucked in safely at night! Basically, when it comes to chicken wire, you’ll pay for how tight the weave is (whether there’s ¼-inch holes or 2 inch holes) and the length. The longer the roll, the more it’ll cost. You might be looking at all your choices and wondering “How much is chicken wire that’ll do the job right” – there are lots of options after all. Most flock owners will want to go with chicken wire that has ½ inch holes – this is small enough that it’ll be tough for most predators to get through. It’ll also be stronger, and less likely to be bent out of shape. There are many places where you can buy chicken wire for sale, like your local hardware or poultry store, and most especially online. With simple searches like “chicken wire Tractor Supply” or “chicken wire Lowes,” you’ll find an array to choose from for your coop. And don’t leave out the chicken wire Ace Hardware has that has a multitude of uses for all types of poultry! Chicken wire comes in several sizes. Small chicken wire is ½ inch (that’s the size of the holes) while larger options come in sizes of 1 inch or 2 inch varieties. It’s also available in various gauges – 19 gauge to 22 gauge. The larger the gauge of galvanized wire, the stronger it is. It also comes in various lengths, from 10 feet to hundreds of feet. If you search online you’ll find many informative videos showing you how to set-up and install chicken wire. Most videos show you the entire roll of wire being straightened out; if you have a large area that’s a great idea, but what if you don’t need that much? Simply unroll the wire to just beyond the desired length, hold the loose end down with something heavy so it doesn’t curl back up. At your chosen length, use your wire cutters to cut a piece about 2 inches longer than needed. Once cut, fold in the cut edge about 1 inch at either end careful to avoid sharp edges. Then apply to the top of your frame and staple all along the top ensuring the wire is straight and firmly in place. Now do the same for the bottom edge pulling the wire taut. Once you have top and bottom done do the same for both sides while remembering to always pull the wire taut. You will want to use an industrial stapler – not the same type of staples you use for paper. The stronger and thicker the staple, the less likely a predator can rip it down. At the corners, you’ll want to trim the wire instead of turning the corner – this ensures the chicken wire won’t buckle and lay weirdly. If you don’t want to use staples, you can use nails to secure your chicken wire. Simply nail a 1×2 piece of lumber over the top of the chicken wire panel. Then fasten it to the post with galvanized nails or wood screws of the appropriate size. Note that this is more difficult and less secure than stapling the wire. You can also simply bend nails over the chicken wire to secure it. Hammer the nails into the wood part way, then hammer them so they’re bent and securely keeping the wire in place. Just know that this looks ugly and is more labor intensive than simply stapling the poultry mesh into place. To keep your chicken wire firmly in the ground, simply place a few heavy rocks on the wire at the bottom of the trench and toss soil back into the hole. While not strictly necessary when building a coop, it’s a good idea to bury chicken wire in the ground to keep out predators. You can either bury it perpendicular to the ground or horizontally. It’s best to space poles for fencing no more than 8 feet apart. Not typically. Galvanized chicken wire is usually rust and corrode resistant, especially if it’s been coated in plastic. You’ll find that your coop run will stay shiny and fresh looking for years! Poultry staples (not the kind made for staple guns) are best to secure your galvanized hardware cloth. It depends on the predator and the size of the holes. It also depends how securely the wire was attached to the wood run. If installed correctly, chicken wire should keep out most predators, even very aggressive ones like coyotes. It’s important to remember to always bury chicken wire to keep out predators that dig (like dogs and foxes). However, if it’s not been properly installed and a hungry bear wants to get to your flock, you’re likely out of luck. Predator attacks are one of the top reasons chickens stop laying eggs, or lay abnormal eggs. If it’s not securely attached, raccoons will try to pry it off or bend it enough so that they can squeeze through. They’re also great at sticking their fingers through chicken wire. In some cases, you might find raccoons can rip it apart. If this happens, then it’s better to go with hardware cloth, which is tougher and comes with ¼ in holes. A nimble predator like the fox can scramble over a 6ft fence, jump up to 3ft, and dig under it. If foxes are an issue in your area, consider using hardware cloth instead. Just like foxes and raccoons, skunks can chew through chicken wire. Be sure to bury the fences at least 6 inches in the ground to avoid this. If you find skunks keep getting into your coop, then switch to hardware cloth fencing. Another thing to consider is choosing a chicken feeder and waterer that’s inaccessible to raccoons and skunks. The chicken wire was invented in 1844 British ironmonger Charles Barnard, son of a farmer, Barnard wanted to help his father by finding a way to keep wayward chickens from fleeing the coop. He based his design on cloth weaving machines and soon established his firm Bishop & Barnard. The hardware cloth is considerably stronger than chicken wire because it is a wire mesh that consists of either woven or welded wires in a square or rectangular grid. It’s available in galvanized, stainless steel and bare steel. It is manufactured from a stronger gauge metal than chicken wire. I enjoy reading all the information U supply to the readers thank you.